Plasma and LCD televisions may have a delay in displaying the image, due to the digital processing done by these types of displays. This delay is quite small, however it may be disconcerting for some viewers. It's possible to delay the audio from OtsAV, so that it is perfectly in sync with the video on your displays. 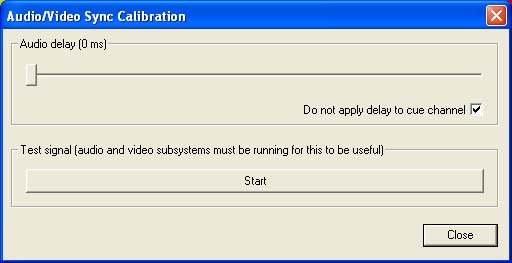 Audio Delay - move the slider to increase or decrease the audio delay applied. Do not apply delay to cue channel - leave un-checked if you don't want the audio in your Cue channel delayed. Test Signal - starts the test audio and video signals. Listen to the test beep and watch for the video flash. Adjust the Audio Delay slider until the audible beep and flash on your 2nd display are perfectly in sync.